In this experiment, you're going to learn how to get characters to display on a 32-character LCD screen (2 lines, 16 characters each). You'll start with 1s and 0s but quickly progress to "Hello" and displaying the date and time. Finally, you'll be able to use the LCD to show the current location of satellites in space! Note: These steps only have to be done once, but they are required. Internet connection may be necessary! The J5IK includes a Liquid Crystal Display (LCD) screen. This screen is similar to one that you may find in your microwave, on your dashboard in your car, or if you are old enough to remember, a Speak and Spell. 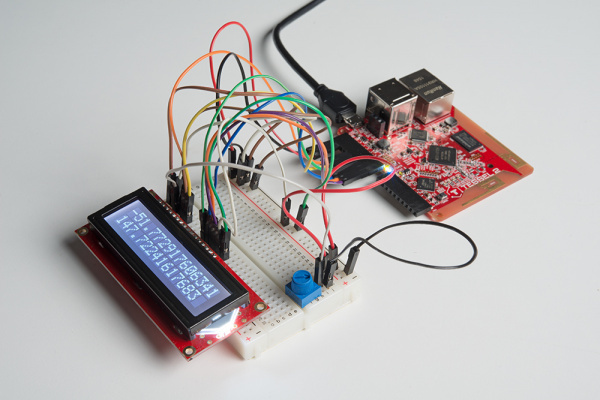 LCD screens are a great way to display data or information from your Tessel 2 board without having to have it connected to your laptop. The LCD screen in this kit can display 16 characters on each of its two rows (32 characters total). The wiring in the diagram can look a little bit like a rat's nest, but it's not so bad if you take care with your connections. The potentiometer in the circuit can be used to adjust the display contrast on the LCD. 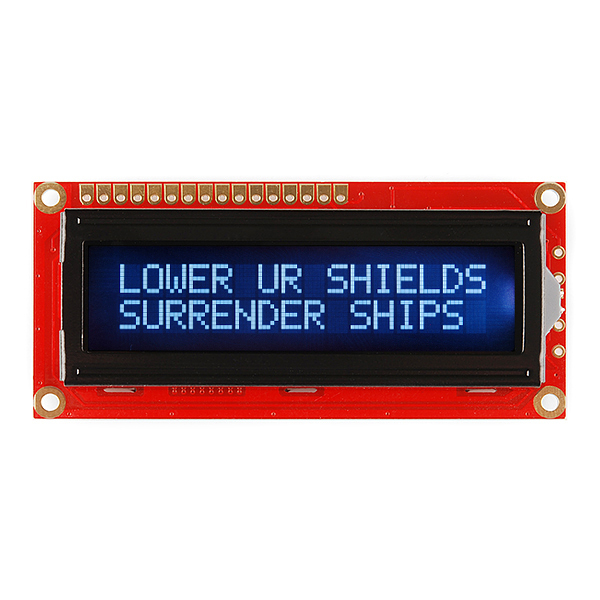 Are you ready to print some text on your LCD? Let's get this circuit wired up! Note: The LCD board has 16 pins, numbered 1 - 16 from the top as oriented on the breadboard in this experiment. Connect the LCD board to the left side of the breadboard. Connect LCD pins 1, 5 and 16 to the ground power rail. Connect LCD pins 2 and 15 to the supply power rail. LCD pin 4 to Port A, Pin 2. LCD pin 6 to Port A, Pin 3. LCD pin 11 to Port A, Pin 4. LCD pin 12 to Port A, Pin 5. LCD pin 13 to Port A, Pin 6. LCD pin 14 to Port A, Pin 7. Connect the potentiometer to the breadboard. Connect jumper wires between its outer two legs and the power rail on the breadboard. Connect its middle leg to the LCD's pin 3 with a jumper wire. 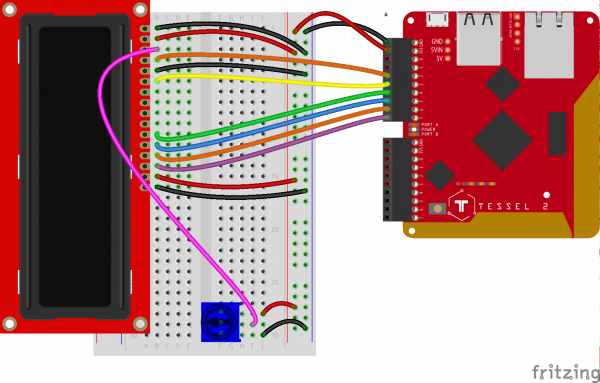 Connect the Tessel's 3.3V and GND pins to the breadboard's power rail with jumper wires. Not seeing any digits? Try turning the potentiometer—it adjusts contrast on the LCD. These six pins (RS—Register Select, EN—Enable, and four data pins) are used by Johnny-Five to control the LCD. The print(message) method tells the lcd to print the provided string message to the display, starting at the present cursor position. The 1s and 0s should be cleared, and the message "Hello!" should be displayed. Before moving on, try changing that message to a message of your own. Before we get into the next program, you'll need to install a module that makes working with date and time less of a chore. Hands down, the most comprehensive module for this task is Moment.js. Wait... 10?? Yes! That's why we made sure to point out which timezone this was running in. The Tessel 2's internal clock defaults to UTC; the timezone can be set in a number of different ways, but the easiest (for the purpose of this experiment) is to use the moment().utcOffset("-0400"). Try figuring out where this change should be made in your program! The next line portion sees the return of a familiar method: board.loop(ms, handler). This was used several times in earlier experiments to produce interesting, iterative LED lighting patterns. Here it's used to check the time every 1/10 of a second to see if an update to the LCD's display is necessary. The 10Hz timing frequency is arbitrary, and you're encouraged to experiment with other subsecond periods. If the update value for a line differs from what is currently displayed on that line (stored in snapshots), that line on the LCD is updated with print. This comparison makes sure we don't wastefully print to the LCD if nothing has changed. OK, here's the cool part. We're going to use the LCD to display what's going on in space. We're going to display the location of the International Space Station on your LCD's screen. To do this, we'll need to install one last new module: iss. This module wraps the data that's made available by Where the ISS At?. The current latitude of the ISS is displayed on the first row and the longitude on the second row! Then, after the board is "ready" and the LCD is initialized, we call the iss.locationStream(...) function, passing the ISS ID (25544) and Max Requests-Per-Second (20) arguments. The "Max Request" count is a limit on the number of requests (for new location data) to the remote data server. The data event handler will be called every time a new location object is received. Create a "vertically scrolling" display of the ISS data.